Impending state primaries and an increasingly partisan media landscape serve as the perfect incubators for start-up conservative news sites vying for political influence. One such outlet, the Tennessee Star, was created in 2017 to "fill a void" in conservative thought, its co-founder Steve Gill told CNN's Brian Stelter. And now, after enjoying some momentum -- the site has amassed 7 million page visits within its first 14 months, Gill said -- he is looking to expand his operation, perhaps even to other states. "If you want to have political influence, you need to be planting a flag and competing with the left-leaning mainstream media in the Ohios, in the Pennsylvanias, in the Colorados, in the North Carolinas in some states," said Gill, who has also hosted several conservative talk radio shows. "In some of these states that will be battleground states in 2020 and the presidential race, we see a huge opportunity." For Gill, everything rests on the premise that "the media works best when it's local." While Breitbart focuses on national news, he said, there's value in covering "the local stories that... are being lost as the mainstream media reduces size," and bringing in reporters with the "historical perspective" of a small area. 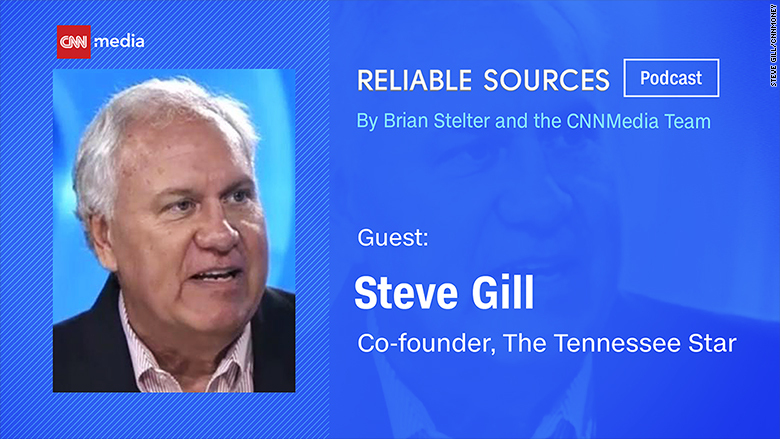 As the guest on this week's Reliable Sources podcast, Gill laid out how his site came to be, how the Tennessee Star is serving readers, and why he thinks the liberal version of a "baby Breitbart" wouldn't work. Described by Politico's Jason Schwartz as "opaque, locally focused, ideological outlets, dressed up as traditional newspapers," "baby Breitbarts" look like standard news operations, but are often covered in political ads and don't include ideological labels. "When the Washington Post, New York Times, Politico, CNN, the Tennessean start having a masthead blazing, 'We're flaming liberals,' then we'll put the same kind of conservative bent on our masthead," Gill told Stelter. Gill, also listed as a political editor on the site, considers the Tennessee Star "90% reporting and about 10% opining." "I know that our focus has been on accuracy and news first, even if it's from a conservative perspective," Gill said. "And one of the criticisms I think that's been launched is, 'Well, you're just out there to promote the Republican Party.' I think Republicans in Tennessee would differ with that... A lot of our news coverage actually hammers on Republicans who aren't being conservative in their values and their voting." Gill said advertising opportunities abound at the site. Despite a report by New York Magazine that the outlet's founders see the publication "primarily as a tool for influence (as opposed to profits)," Gill says this is not the case. "We've got to make money," he said. For all the buzz around "baby Breitbarts," some are floating the possibility of a left-leaning counterpart. Gill says this isn't realistic. "Why do people need to tune into a liberal talk radio station when they have all the other media at their disposal?" he asked. "That's why I think the idea of the 'baby Breitbart' liberal version won't necessarily work, because locals aren't going to have to gravitate there. You've got plenty of other choices to get your news."